Hey blog. It's been awhile. Like almost a full year. A lot has happened since then. Most notably I moved from coast to coast with my family for a great work opportunity and experienced my first year of fatherhood. As if that wasn’t enough, I even made it out to see Jurassic World more than once. I've kept a list going of blog post ideas, always with the intention of getting around to them, but other projects took priority. I may have let this piece of internet real estate take a back seat, but never stopped writing. I'm writing a sci-fi comic being published by Heavy Metal. I've waited a long time to say that. The journey leading up to this point began just over two years ago when I first was put in touch with the British writer/director of an indie sci-fi movie, which was in post production and titled Dreck at the time. Justin Trefgarne and I spoke at length about his movie and his desire to expand the property into comics. He sent me the script and from there I began crafting an original story that would work alongside the movie as a companion piece. Playing in this world, of what would later become known as Narcopolis, was exactly the kind of storytelling I wanted to be apart of, but there was still a long way to go to see it all come together. I needed an art team. Enter Ralf Singh, who being based in Germany, I still to this day have yet to meet in person, but I instantly loved his art I saw him posting samples of on twitter and we connected soon after. The material immediately clicked with him the same way it had for me and he was soon cranking out character designs based on the cast. I can’t wait for you all to see more of it. To make a long story short, once we got the official greenlight from the film’s distributor, we assembled the rest of the team. Taylor Esposito of Ghost Glyph Studios is not only one of the best in the biz but one of the nicest too so I looked no further and he’s gone above and beyond really showing off his skills with this one. 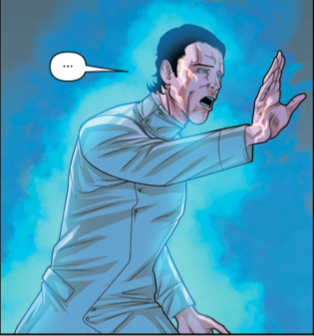 Ralf pointed me in the direction of colorist Nic Chapuis (a fellow German) and I’ve always felt strongly that colors can make or break the art and his colors combined with Ralf’s art is just… well see for yourself (not to mention Taylor’s expert graphic design to make it complete). And to help keep the quality high and make sure the team gels together and hits our deadlines, I happily employed the talents of editor supreme Valerie D’Orazio who is the definition of professionalism and a fantastic sounding board throughout the process. “So what’s the name of this comic and when can I pick it up?” I imagine you asking, followed by, “Don’t put words in my mouth!” Great questions and concerns. I’ve already gone on long enough so I’ll be brief. Or as brief as I can be (I’m clearly not into the whole brevity thing). The comic is titled Narcopolis: Continuum. 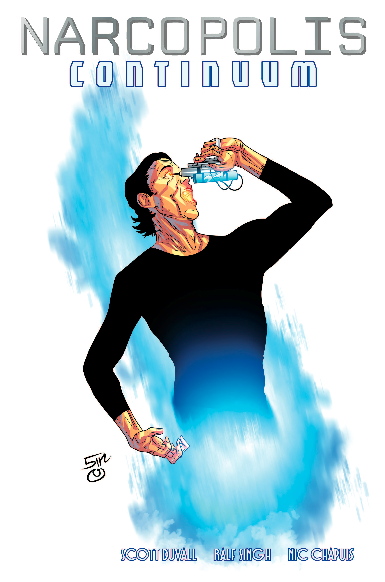 It’s a 4-issue mini-series and you can pick up the digital copy as early as end of September (same as the movie)! 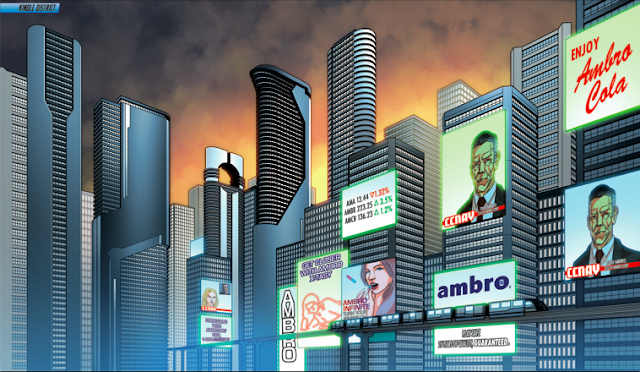 But if you’re like me and you enjoy the incomparable experience of reading you comics in print, the print edition of issue one is hitting early November and you can pick it up from you local comic shop (don’t forget to order it). Still can’t wait until then to check it out? Well, you’re in luck because the first 10 pages (that’s half the issue!) are in the August edition of Heavy Metal Magazine along with an interview with some of the creative team. I highly suggest you pick it up anyway as there’s always a ton of great artwork in the magazine which Heavy Metal is known for. Anyway, if you’ve made it this far, congratulations! You deserve something for sticking it out with me and reading all this when you clearly have other things you need to be doing so here’s another little teaser as a reward. Thanks for reading and if you feel like reading a little more, here’s the official announcement over at The Hollywood Reporter where Justin and myself talk to kickass journalist Graeme MacMillan about the actual story itself. I'll be updating this blog a little more often as anything worth highlighting comes in, but if you'd like to follow updates in real time, you should maybe consider following me on Facebook and Twitter as I'll be updating those with more info on the comic semi-regularly. I’m super excited to see this finally become a reality and hope you’ll come along for the ride. This past summer I was invited to contribute to the site PopMatters in compiling a list of the Top 100 Albums of the 00s. The idea being that with time and distance to reflect on the past decade of music, this list would represent the albums that have held up in the years since and isn’t simply a quick reaction. I was asked to submit my Top 10 albums of the decade to be considered for the master list. Out of my selections, at least two of them were selected for inclusion, which I then wrote a blurb for (#2 & #3 on my list). When I first started this blog, I wanted to write about music in addition to my other interests which I haven’t gotten around to but this seemed like a good place to start. Here is my personal list of the Top 10 Albums of the 00s. Figure 8 receives more attention, as it was Smith’s final release before his untimely death and for many, the gateway album to the artist’s back catalog. However, From a Basement on the Hill is the punctuation mark on a career cut far too short and left a haunting final impression of a misunderstood genius. Gone are the sweeping orchestral instrumentation that his major label efforts afforded. This is Smith back to basics and quite possibly his rawest. It may require a few spins to take this one in but it is beyond worth it. Opening with the polarizing Coast to Coast and concluding with A Distorted Reality is Now a Necessity to be Free (which sounds like the best song The Beatles never wrote), Basement is a masterpiece from start to finish. Songs like King’s Crossing hint at a bold new direction of experimentation while Twilight is so real and honest that it’s almost hard to listen to but too beautiful not to. 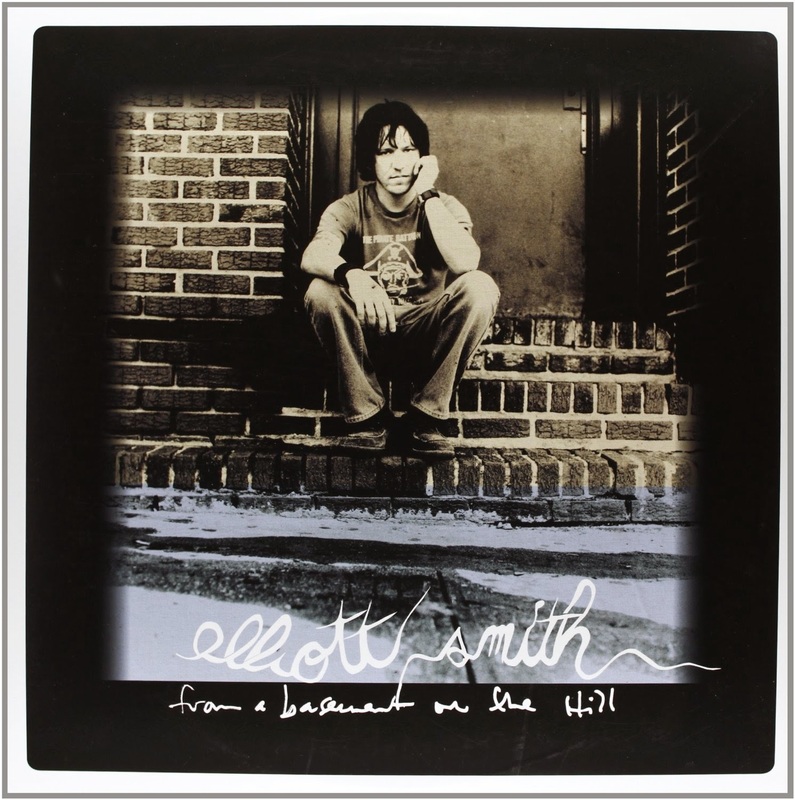 Prolific to the end, Smith originally intended Basement as a double album, and while the castoff tracks are worthy of being sought out, the ones compiled here are amongst his greatest and cement his status as one of the greatest songwriters of his, or any, generation. 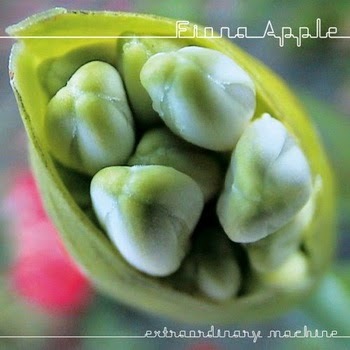 The only album Fiona Apple would release during this decade, Extraordinary Machine was received by a fervent fan base after having been long delayed. What they got was essentially take two, after some unreleased tracks from initial producer Jon Brion were leaked before being re-recorded. Either version would have been fit for inclusion on this list and Extraordinary Machine makes you wish Apple would cut a new album more often than once or twice a decade (if we’re lucky). At least you can be assured that when she has amassed enough songs that she deems worthy of releasing that they’re going to pack an emotional punch. Everything about this album is completely methodical from the confessional lyrics on Not About Love to the deliberate sour notes in O’ Sailor, and you can almost hear her heart breaking on Oh Well. It’s obvious a lot of preparation and thought went into each track yet it still managed to capture a spontaneous energy as if Apple only had enough studio time to record each track in one take and whatever came out of those sessions is what we got. Not only does it stand out for sounding like nothing else released in the 2000’s, it’s also a welcome departure from Apple’s previous releases, showcasing her ability to reinvent her sound and continue to evolve without betraying who she is as a person and as one of the best singer/songwriters of her generation. The sophomore album is challenging for any band looking to exceed expectations and that was no different for Harvey Danger. Riding high off the massive success of that song, it was a question of whether or not they could maintain that momentum while continuing to build upon a solid foundation. Despite a noble effort, King James Version fell through the cracks, not only failing to recapture their debut album’s mass audience, but essentially fading from existence as quickly as it landed with the mainstream having decided that Harvey Danger had worn out their welcome, thus sentencing them to “one-hit wonder” status. In retrospect, they did exactly what a band is supposed to do for its follow up. They one-upped their song writing with biting lyrics offering thought-provoking entertainment value all their own (singer Sean Nelson remains one of the most criminally underrated lyricists alive), not to mention killer hooks courtesy of irreplaceable bassist Aaron Huffman, not afraid to lead the melody. The so-called “alternative rock band” even managed to sneak a piano ballad in there, highlighting guitarist Jeff Lin’s classical training, while also serving as a good primer for their (as of now) final album Little By Little, hinting at the direction their music would take. 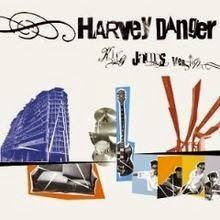 In essence, Harvey Danger is everything you think they’re not and King James Version is definitive proof of that. 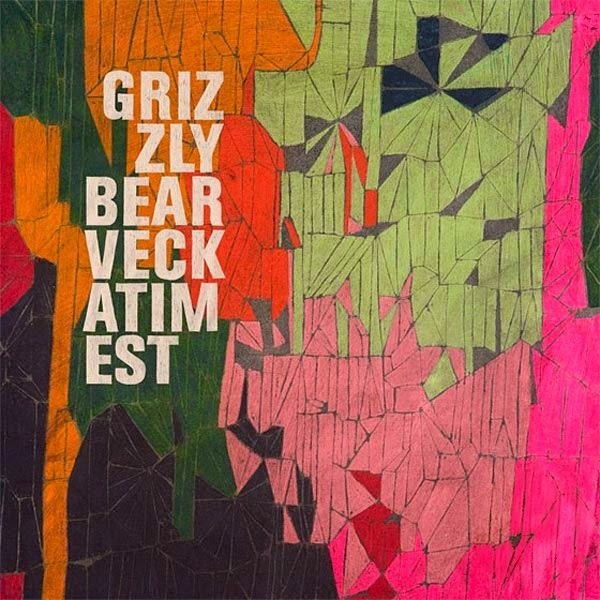 Released in the final months of the 00s, Veckatimest was my first introduction to the Brooklyn based quartet known as Grizzly Bear. The group was quickly added to my regular rotation as I absorbed the hauntingly beautiful melodies and cryptic, yet minimalist, lyrics that encompassed their sound. From the up tempo opener Southern Point to the stripped down and somber piano ballad Foreground which rounds out the album, the group takes us on a musical journey quite unlike any other I experienced that decade. Every song has its own distinct flavor; the bouncy piano of Two Weeks, the soaring vocal harmonies of While You Wait For The Others and Ready, Able is an acid trip for the ears (and eyes if you watch the stop motion music video). A handful of these songs also appear in the film Blue Valentine, which the group wrote the score for, and considering the deterioration of the relationship onscreen, this album is perfect breakup music. It’s not happy music, but it permeates the soul. In my humble opinion, if Radiohead announced the shift in the decade’s musical landscape with Kid A, then Grizzly Bear finished that thought with Veckatimest. 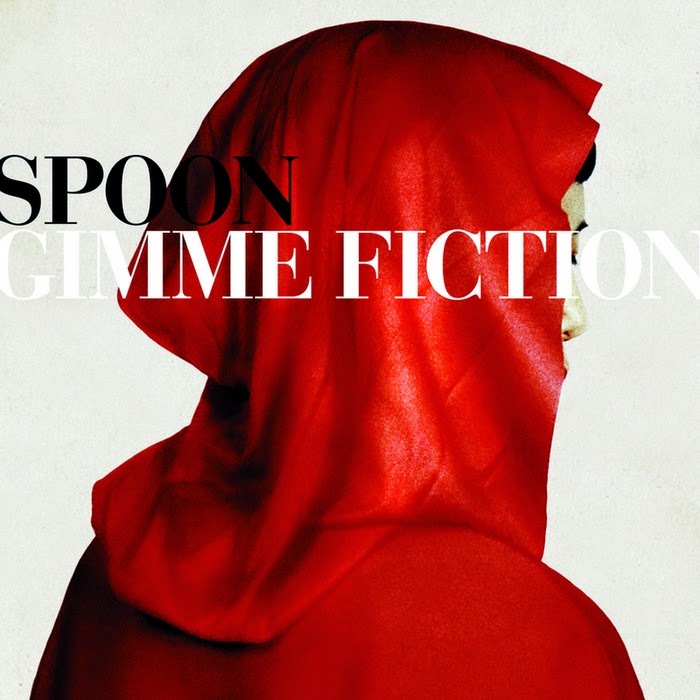 Of all their albums, Gimme Fiction is quintessential Spoon. It does not get much better than this in terms of what this band is capable of with their entire prowess on full display. Whereas Spoon are masters at producing catchy hooks and bouncy melodies, there’s some added weight to these songs that reveal a moodier side that suits the band just as easily as the tambourine shaking Sister Jack. No other group today incorporates piano into the mix quite like this one, eliciting an ominous, almost dangerous quality on such songs as The Two Sides of Monsieur Valentine and The Beast and Dragon, Adored not to mention the pounding groove of My Mathematical Mind. Never has bass playing complimented the piano quite like this either, standing out as the MVP instrument on multiple tracks. They’re clearly having fun here experimenting with their sound while not overhauling it either and in doing so they crafted some of the best tracks of their career. In nearly a decade since its release, Spoon have come close to the artistic heights of Gimme Fiction but have yet to top it. It’s a hard act to follow for them or any band who may attempt to occupy the same space as Spoon so clearly dominate. 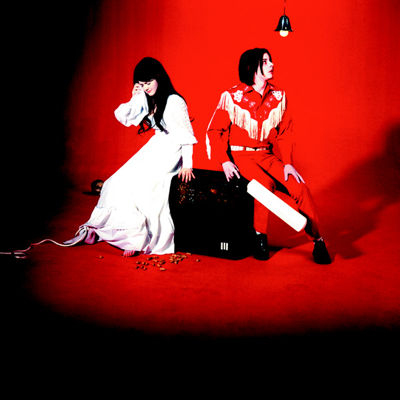 Jack and Meg White’s fourth album took both their fans and the critics by storm delivering their most polished and ambitious album at that point. While both Get Behind Me Satan and Icky Thump, which followed, are worthy albums in their own right, they failed to top the duo’s masterpiece, Elephant. The White Stripes remains my favorite of the “The” bands that burst onto the scene during the first half of the decade (The Strokes included) and rightly catapulted frontman Jack White to rock star status. If there’s one song that defines the band, it is undoubtedly Seven Nation Army, which is so deceptively simple in its catchy and instantly familiar melody, it’s practically a contemporary blues standard by now. And that’s just track one. The Stripes straddle the line between delivering straightforward garage rock and slower ballads, such as In The Cold, Cold Night, where Meg steps out from behind the drums to take lead vocals. It was a gamble as she is not the strongest singer but it shows that they were not afraid to branch out and shake things up from song to song. The White Stripes are probably never coming back, but with what they’ve given us here, it’s hard to complain that they owe us anything more. 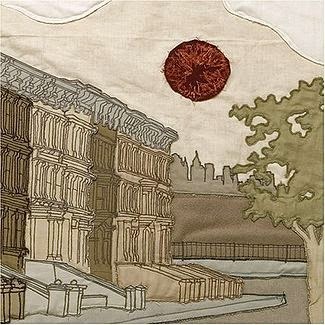 One of two albums released by Bright Eyes in 2005 (the other being the electronic inflected Digital Ash In A Digital Urn), this album was the clear favorite among fans. Digital Ash… was practically an experiment just to showcase how versatile the group’s members are but the music on I’m Wide Awake It’s Morning is clearly what kind of music they were born to make. The folk inspired sound incorporated slide guitars, mandolin, and even guest vocals from country legend Emmylou Harris. The result was a collection of timeless songs that sound like they were written by a world-weary traveler as opposed to a guy from Omaha in his mid-20s. Conor Oberst’s wears his influences on his sleeve from Townes Van Zandt to Leonard Cohen and it’s fitting that one track is titled Old Soul Song as I can’t think of a more fitting description for someone that would create this music than an old soul. The album’s songs range from the stripped down Lua which is simply a man and his acoustic guitar singing confessional lyrics softly, reminding us of Oberst’s humble beginnings making home recordings on a four track cassette recorder in his parent’s basement, but then ends triumphantly in a chaotic burst of horns blaring as he screams the album title at the top of his lungs on Road to Joy. It feels like a celebration of life and that’s what this album represents. Out of all the artists represented here, The Decemberists were the ones I had the most difficult time selecting which album would best represent them. 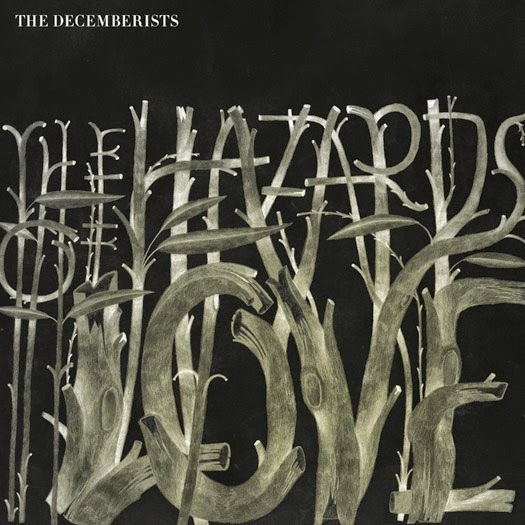 Her Majesty was my gateway with its instantly accessible melodies, and The Crane Wife is a perfect work of art but Hazards of Love still manages to one up it. Continuing on with the Portland based group’s exploration into gapless concept albums, Hazards of Love is something special that can only be described as beautiful. As with The Crane Wife, it paints a picture, drawing in the listener in only the way a great storyteller can. As with Bright Eyes’ Conor Oberst, who sings “I could have been a famous singer if I had someone else’s voice,” the group’s leader Colin Meloy does not have a traditional polished voice but it suits the style of music to a T with his distinctive singing. But Meloy is not the only one responsible for the group’s unique sound as the group is the sum of its parts consisting of several talented multi-instrumentalists. Put simply, this album deserves you full attention and cannot be listened to in segments as it is one hour long song that as soon as it ends you’ll want to hit repeat and experience again and again. It took me a few listens before I really GOT Interpol. I first saw them 10 years ago as part of The Cure’s Curiosa Festival as they were part of a lineup of hand picked bands to tour with The Cure which included such acts as The Rapture, Mogwai and Muse. I had no idea what to expect and hearing them for the first time in that environment didn’t inspire me to dig any deeper as I was still deep into my punk/ska phase from my high school days and was only just beginning to venture out in my tastes on the road to musical discovery. 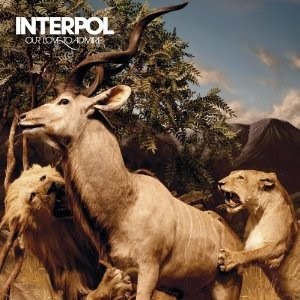 Five years later I gave Interpol’s Our Love to Admire another spin and I haven’t looked back since. So THIS is what I’d been missing out on. Paul Banks’ monotonous vocal range wasn’t trying to impress you, but was teeming with emotion regardless. Like Television before them, the band’s sound didn’t revolve around the vocals but the interplay between the guitars and heavy hitting rhythm section. Is Our Love To Admire better than the group’s freshman and sophomore albums that released earlier in the decade? It’s worthy of debate, but for me this is the album that opened my eyes to what Interpol had to offer and for that, it scores a place on the list. When I lived in LA, Muse got a lot of radio play on KROQ. I mean a LOT. To the point where I was sick of them. But then I noticed something. I wasn’t switching the station. In fact I was starting to turn it up. And then after awhile I was singing along at the top of my lungs. It was THE anthem of 2006 and it’s just as relevant now as it was then. Then I heard Starlight and it was all over. These guys were writing music that sounded like it was recorded on Mars. I couldn’t believe that this much sound could come from just three guys from England. Then I listened to the full album and was blown away. It was so powerful that it demanded repeat listens as you couldn’t absorb it all at once, there was too much going on at once. 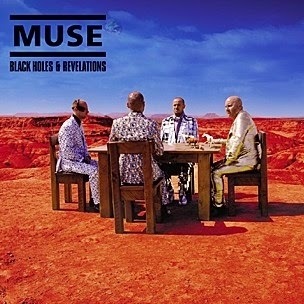 It bares mentioning that the follow up album The Resistance deserves to go in this slot just as much for its ambition and scope (not to mention its 1984 references) but Black Holes and Revelations edges it out simply because it was such a turning point for the band.